A visa to enter Greece (and Crete) is not required for citizens of the United States, Canada, and the European Union. Citizens of all other countries should contact their nearest Greek consulate or embassy. It is not possible to rent a motor bike or scooter or bicycle in Sfakia. 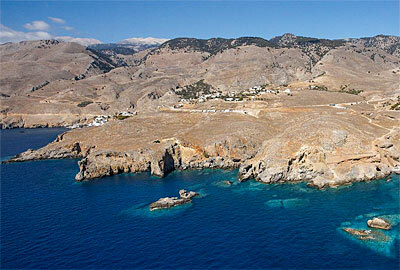 Most nearby is Plakias. Currency in Crete and Greece is the Euro. Electricity in Crete and Greece is 230 V AC. The time is EET: Eastern European Time zone: this is GMT/ UTC +2 hours. Crete and Greece follow the Summer and Winter Time protocol, like the rest of Europe. • There is a money cash machine/ cash dispenser/ ATM in Chora Sfakion, on the village square. The ATM accepts VISA, MasterCard, Maestro and American Express cards, and you will need your card's PIN CODE. It also accepts regular bank cards from your country, as long as they are Maestro-enabled. Bring your PIN CODE! • Credit cards are not (widely) accepted in hotels, shops and restaurants. • There are no banks in Sfakia. • There is also a bank with a general ATM/ cash machine is in the village of Vrisses, one hour driving north of Sfakia, or in Plakias one hour to the east. • In Chora Sfakion is a post office, opened on week days until 14.00 PM. • In Chora Sfakion and Agia Roumeli is a first aid, and in Chora Sfakion also a medical center with a doctor and nurse. • Multipurpose Regional Medical Clinic of Sfakia: Tel: 28250-91214. To make an appointment to see the doctor: +30 28250 91128. • A pharmacy can be found at the village square of Chora Sfakion. • There is a dentist in Vrises and Kalives and a dental clinic operates in Sfakia every Tuesday and Friday from 10 am until 8pm with tel. +30 6944347603. • There is a 24 hours health center in the village of Vamos. • Hospitals are in Chania, both private and from the State. The manager of your accommodation is always willing to help you in case of health problems. They can phone for you or take care you'll get the help you need. • Sfakia has an emergency boat, in cases of medical problems occuring in the coastal villages that are not connected by road. • In case of serious problems an ambulance can come over from Chania, but the Regional Medical Clinic in Chora Sfakion now also has an ambulance. • There is also a rescue helicopter available. Internet in Sfakia: Chora Sfakion has Wifi (wireless internet access) internet connection all around the village. Ask your hotel manager or restaurant host when you are there, to give you the access code. Some hotels also offer internet access through a public PC in their building, and a ethernet connection in their rooms. International telephone and fax is available for your use in all accommodations at low costs per counter click. There are also public phone booths, that work with telephone cards you can buy locally. 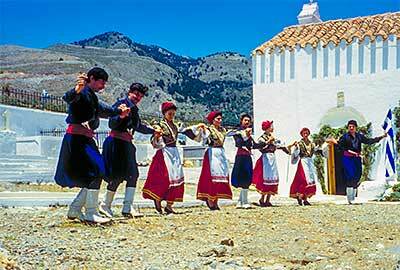 Your own mobile phone will work while in Sfakia. You can make a choice for the networks of several providers. Please note that while in the mountains (walking or driving) your connection may get lost for a moment when a mountain or ridge gets between you and the 2 antennas in Anopoli (650m). In gorges and in the mountains there may be no connection at all. In Sfakia is a police station. Tourist Police operates an emergency telephone line on a 24 hour basis (just dial 171 any day, any time, from all over Greece). 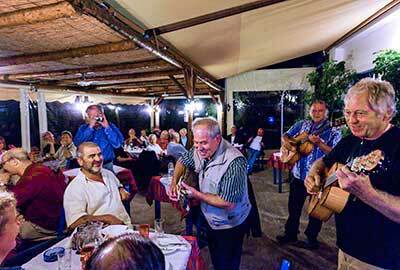 Food in Sfakia: All villages have restaurants and tavernas, most of them are open from 07.00 AM until midnight. They serve breakfast, lunch, and dinner. In both Chora Sfakion and Frangokastello are two supermarkets, opened until about 22.00 PM. Chora Sfakion has also several bakeries and a butcher. Groceries, vegetables and fruits can be found in the supermarkets. Almost all accommodations can serve breakfast. Drinking water: it's no problem to drink the water from a tap in Sfakia. It comes from natural springs in the mountains and is of good quality and taste. To be absolutely sure there is plenty of bottled mineral or table water available at low cost. Be sure to take enough bottled water with you when you go mountain hiking! Mountain hiking: please be sure to bring walking boots with you with ankle protection. Always inform your accommodation owner of where you are going for your walking trips! Nightlife in Sfakia: if you are looking for discos and night clubs, this is not the right place. There aren't any. Life in the evenings is centered around your dinner in a restaurant or taverna or on a small terrace, having a drink and meeting other guests. Usually you have good contacts with the local people and the athmosphere is very friendly. All places close around midnight, except some places around the village square. In Chora Sfakion is no longer a public laundry. You have to go to Vrisses or Chania.